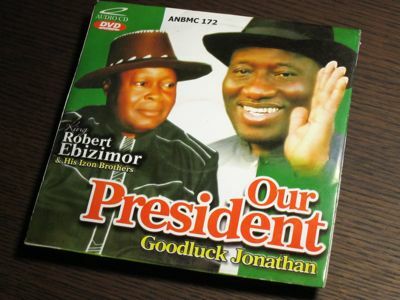 それにしても何と言うタイミングなんだだろう。この "Our President Goodluck Johathan" が彼の遺作になってしまったのかも知れない。R.I.P. THE Ijaws are breasting up to celebrate the 60th birthday anniversary of Niger Delta most celebrated singer, composer, guitarist and band leader, King Robert Ebizimor. Before he became one of the pioneers of Ijaw high life music, the king had engaged in so many ventures such as palm wine tapping, timber merchant, canoe carving and commercial fishing. Things worked out for him. 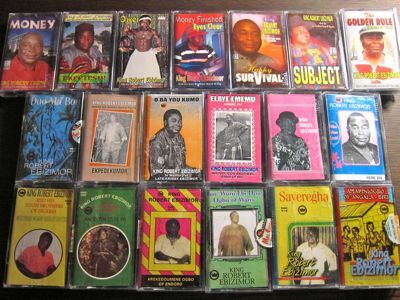 Since he began to make impact on the high life scene in the early seventies King Ebizimor's songs depicted social trends; the philosophy of life, political and economic manipula-tions and indeed all aspects of life. As a born philosopher, his songs conjured images. They were like themes which give root to varying development and movement. The Agaibiri musical king created issues out of themes and provoked the thought of his audience to the point of inspiring and even mobilizing them to action but the greatest weapon is his voice which he projected with happiness and enthusiasm. King Robert Ebizimor's popularity was felt through-out the country and across West Africa, espeically in Ghana. In the early eighties Ebizimor and other gifted stars of Ijaw origin like Professor I. K. Belemu, Master Pereama Freetown, White Eagles, etc. brought back high life nick-named Owigiri in a different style and from dominating the instrumentation with vibrant guitars and exiting rhythms which were missing in the early sixties and seventies.